These easy Mother’s Day breakfast ideas your kids can make are things you will actually want to eat. Let them spoil you on your special day, you are being an awesome parent by taking the time to teach them how to make you a breakfast you will actually love. How do you show your love for your kids? If you’re like most moms I know, it means plenty of self sacrifice and loving acts of service. You cook for them, you bathe them, you do their laundry, you run them to countless activities and special social events. And though it makes you exhausted, you do it because You’re the Mom. This is the natural order of things, right? We do the work, They are the kids. But wait a minute. Someday, our precious little wee ones are going to grow up and a have families of their own. Let’s take a minute and imagine them living in their own homes for just a moment. . .
At the end of a long day, your child comes home hungry from work. What happens next? Do you imagine that they will sit back on the couch while their partner makes the dinner and washes all the dishes after? How about when their partner’s birthday approaches. . . do you picture them at the bakery picking up their own birthday cake while your child watches tv at home? Of course you don’t. You imagine that they’ll know how to help with the work that goes into both the every day and the celebratory milestones in their world. But where do they learn how to do that? Your kids love you. They want to show you just how much. They may make you cards, maybe a teacher helped them make a small craft at school BUT . . . THEY DON’T AUTOMATICALLY KNOW WHAT YOU REALLY WANT FOR MOTHER’S DAY. Notice the ‘YOU’ in there? Not just “how to love”, but how to show their love to one of the most important persons in their world. They want to make you feel like a queen, but they aren’t mind-readers. Take a few minutes on Saturday and give them the missing pieces of the puzzle! And because I know that moms are selfless, don’t do this for yourself. Do it for your child’s future family. Raise a child that knows exactly how to spoil their spouse and do loving acts of service for their kids. Raise them to love others the way that you love them. How do you like your morning beverage? What’s your favorite breakfast? Do you want a magazine to read or total control over the remote? Do you want to enjoy your meal at the table or do you prefer it delivered bedside? Imagine your perfect Sunday morning, describe it to them in detail and watch as they make that magic happen! We are thoughtful moms. Though eggs benedict may be your favorite breakfast ever, let your kids feel like super heroes by requesting simple dishes you know they are capable of making. Just because it’s easy doesn’t mean it can’t be delicious. If you’re stumped, I’ve made an awesome list to get you started. I even designed the sweetest little printable menu for you to check off which items you want. My girls LOVE playing restaruant, give this gift to your own kids and let them spoil you! Get the printable right here. Get the FREE Mother’s Day Menu printable here. Fruit kabobs with yogurt dip: Check out this adorable idea! Your favorite pastry from a local bakery or if you love to bake together, make this cherry almond coffee cake together on Saturday and they can just serve it to you on Sunday. Homemade blueberry scones: I swear, my daughter makes these all by herself! Get the recipe here. 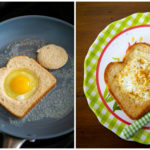 Eggs in a basket: My daughter created a tutorial to teach your kids just how to do it. Check it out here. Waffles: They can use gourmet toaster waffles from the bakery! Hash brown egg nests: Easy since it uses store-bought hash brown mix. Just tell them to skip the fresh veggies or anything they have to chop. Get the recipe here. Breakfast burritos: You could make these with them ahead of time and stock them in the freezer, they just have to heat them up on Mother’s Day morning. Get the recipe here. 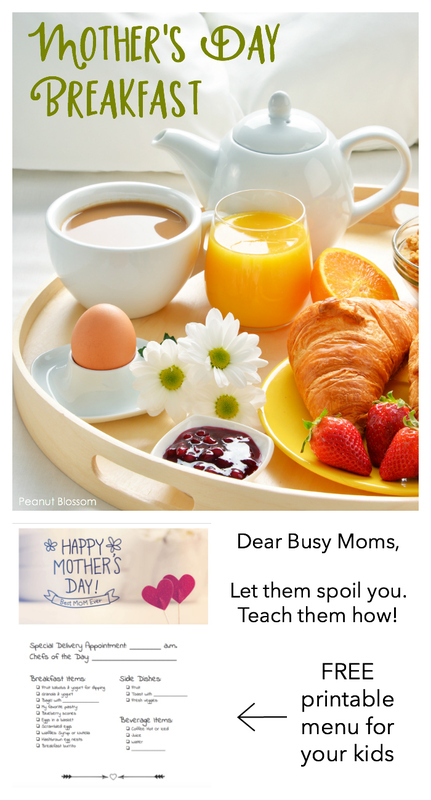 Since I really want you to have the happiest Mother’s Day breakfast ever, I even left space on the printable menu for you to suggest a delivery time (so they don’t wake you up too early!) and a place for the Happy Chef to fill in their name. 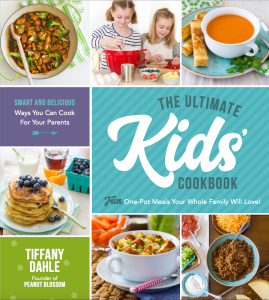 The Ultimate Kids’ Cookbook includes 75 recipes written just for kids who want to cook for their families. Real food for real meals your entire family will enjoy. Imagine teaching your kids to show their love for you through homemade meals all year long! I can’t think of a better Mother’s Day gift than the one that takes a little pressure off of you while teaching your kids to be amazing future adults! Get all the details here and pre-order your copy today! If you want more fun ideas for you and your family, be sure to sign up for my email newsletter. Every week I send seasonal ideas for making family life a little more fun.